When Waters Corp. released the ACQUITY Advanced Polymer Chromatography (APCTM) system for polymer analysis it brought the unsurpassed resolution of UPLC separations to the polymer market. The system allows resolution between polymer fractions not previously seen with the added advantage of low sample use, low solvent use, and significantly quicker analysis. This was, of course, a fantastic step forward but retained the need for column calibration to give relative molecular weight distributions. 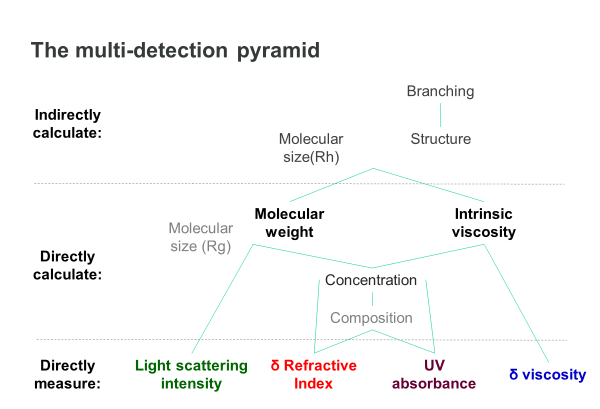 How accurate these values depend on the chemical and structural similarities between the calibration standards and the samples actually under analysis. At Malvern Panalytical we specialize in producing advanced detectors for Gel Permeation Chromatography (GPC) systems. Primarily these are light scattering detectors to give absolute molecular weight, and online differential viscometers to give the structure of a sample. The addition of these advanced detectors to any GPC system is essential if you want to truly compare the molecular properties of different samples. Our passion for providing the best possible sample characterization to our customers has driven us to adapt our advanced detectors to the unique characteristics of the APC system. We have made the OMINSEC REVEAL advanced detector module compatible with APC characterization by further optimising the already good low dispersion characteristics offered by the fully integrated REVEAL module. Most importantly we have not just been working on bringing light scattering to APC but also an online differential viscometer to provide the true structural analysis of a sample. The unique integrated design of the OMNISEC REVEAL module with its world-leading detector sensitives has proven itself to be the ideal detector for APC polymer characterization and adding the value of absolute molecular weight and vital structural information missing from APC analysis. 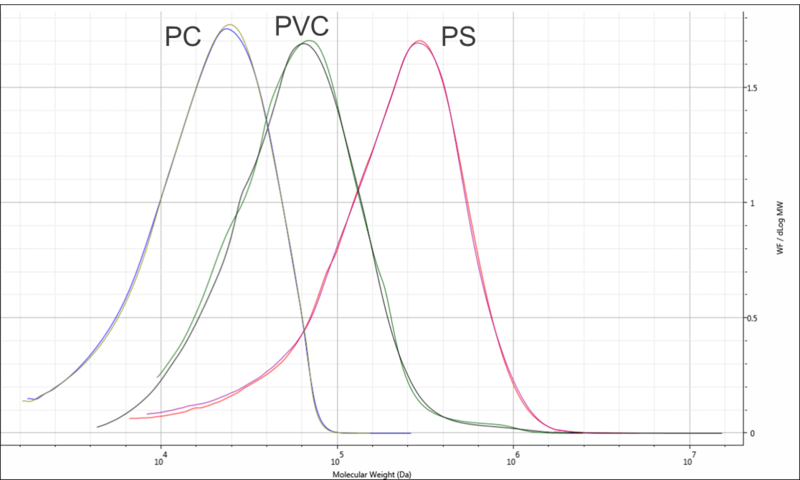 Below is a perfect example of this showing the molecular weight distributions of Polystyrene (PS), Polyvinylchloride (PVC) and Polycarbonate (PC). This is a great result but is only half the story! 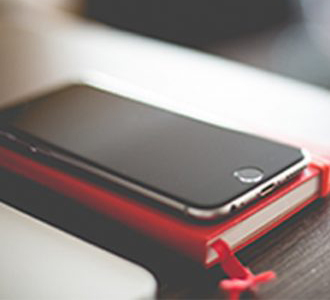 If we want to truly understand the materials we need to introduce an online viscometer. Using the results of this detector we can build a Mark-Houwink plot to compare the structure of our polymers. Looking at the plot below we can see polycarbonate has the highest intrinsic viscosity with polystyrene the lowest intrinsic viscosity. This tells us the different molecular density of the samples, polystyrene has the highest molecular density and therefore is the smallest at a comparable Mw. 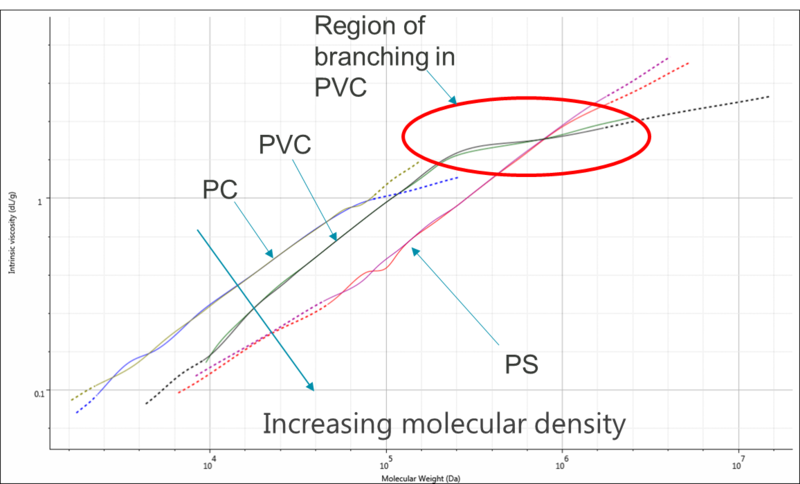 When looking at the PVC sample we can see a change in the gradient of the Mark-Houwink plot. This indicates branching in the sample. So, a light scattering detector on an APC system is a fantastic detector but the addition of the viscometer really brings another dimension to the sample characterization. The OMNISEC REVEAL is the only integrated multi-detector system to give you all this additional insight into your APC characterization. 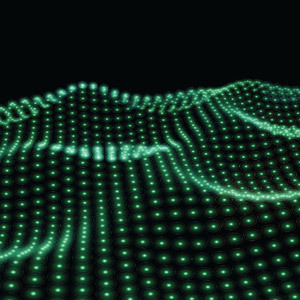 Coupling a REVEAL to a Waters APC retains all the APC benefits and enhances the REVEAL by providing significant improvements in the limits of detection in both light scattering and viscometer detectors allowing true structural insight into your polymers.